Oh no! 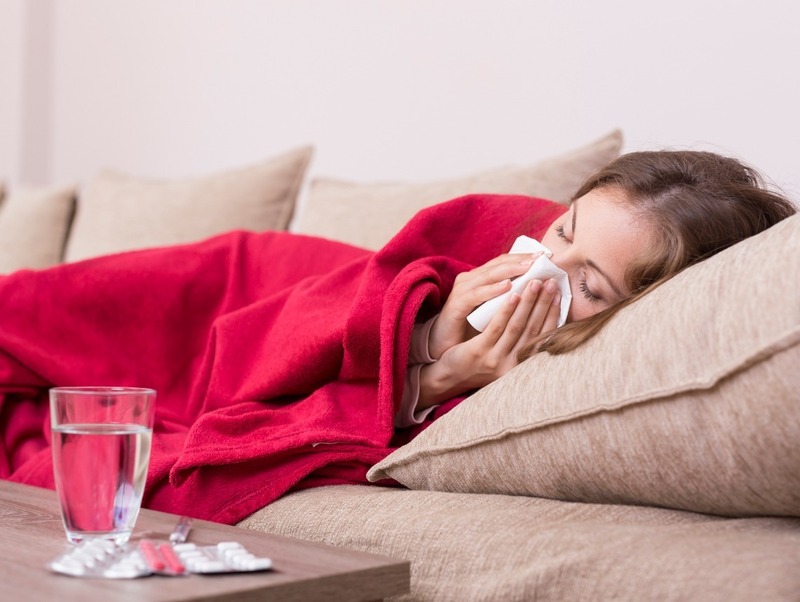 It’s that time of year again – the dreaded cold and flu season. How can we protect ourselves? Did you know that you can be contagious for up to two to three days before you experience any symptoms? This makes it hard to protect ourselves and others. There are several things we can do to help prevent the spread of viruses – and they all involve using common sense. First, make sure you get plenty of rest and sleep. Being rested helps your immune system to be at its best. In general, most people need seven to eight hours of sleep at night. You need to plan your eight hours of sleep just like you plan the rest of your daily tasks. You are not going to miss a day of meals or your daily shower/bath, are you? Discipline your time in the same way so that you get the proper hours of sleep. Get enough exercise. Start an exercise program after checking with your physician, and once you receive the go ahead, put exercising into your daily routine. Twenty to 30 minutes of walking will do wonders for your physical well-being, and it will also boost your immune system, making you less susceptible to viruses. Drink adequate amounts of fluid. There is no need to overdo the fluids, but keeping yourself hydrated properly helps to keep infections at bay. Signs that you are not adequately hydrated are dry lips or a dry mouth. One simple test is to softly pinch the skin of your forearm and if the skin stays pinched when you release your fingers it is a sign that you are dehydrated. Eight glasses (one glass= 8 ounces) of fluid per day is plenty of fluid for a normal healthy person. This can include the different fluids you drink such as coffee, tea, and good old-fashioned water. It can also include solids such as Jell-O or pudding. One of the best things you can do to protect yourself and others is to keep your hands clean. After you’ve been in a crowd of people, or just out in public, simply wash your hands with soap and water. The friction of rubbing your hands with the soap and water is what removes the germs. While you are scrubbing your hands say the alphabet. This ensures you’ve washed your hands long enough to make a difference. These are not complicated preventions, you can easily incorporate these suggestions into your day and have a healthy winter and spring. Nearly 90 percent of all flu-related deaths and over half of all flu-related hospitalizations occur in individuals over the age of 65. The reason? As we age, our immune systems weaken, making us susceptible to developing serious complications from the flu and other common illnesses. Is it true that you don’t need to get another flu shot if you received one last year? No. The CDC recommends each individual over the age of 6 months receive an annual flu shot. Not only do our bodies’ immune systems change, but the flu virus also changes from year to year, forcing scientists to constantly improve these vaccinations to fight off the newest strains of the virus. Can you get the flu directly from the vaccine? No. Neither the flu shot nor the nasal spray vaccine can give an individual the flu virus. According to the CDC, flu vaccinations are made with the flu virus that has been “inactive” and therefore not infectious. Some individuals may experience symptoms after receiving the vaccination (ex: mild headache, muscle aches), but these are often side effects from the vaccine itself, not the virus. Is it true that the side effects of the flu shot are worse than the flu itself? No. Side effects from the flu shot may include mild fevers and muscle aches, while the nasal spray vaccine may also cause mild headaches, nasal congestion, cough, and a sore throat. These symptoms may only last a couple of days, while the flu virus may last up to two weeks and cause serious complications (ex: pneumonia) for seniors and those with chronic medical conditions. Receiving an annual flu vaccination adds a layer of protection against these complications. How soon after getting the flu shot am I protected? According to FLU.gov, it takes about two weeks from the time the vaccination is administered for antibodies to develop and protect an individual against the flu virus. During this two-week period, individuals are still at risk for developing the flu. Where can I get a flu shot and how expensive is it? Contact your or your loved one’s physician for more information about flu vaccination availability and cost. Flu shots are available at most pharmacies, drug stores, grocery stores, and other community centers and local events. Most insurance plans, including Medicare will cover all or most of the cost of an influenza vaccine each year. Otherwise, influenza vaccines may cost around $30 or less. How can I protect myself and loved ones from the flu? The most effective way to protect yourself and loved ones this flu season is by getting vaccinated. This is especially important for caregivers and family members where the flu virus can spread quickly from one person to another. Practicing healthy habits (washing hands quickly, avoiding close contact, getting plenty of rest, etc.) and seeking medical attention as soon as symptoms begin are all effective ways to protect yourself and loved ones against the flu. Taking the necessary precautions to protect yourself and loved ones against the flu is important – especially when caring for someone with a weakened immune system. Despite your best efforts, illness can strike at any time. When that happens, Sonas Home Health Care is here to help. Whether you need temporary assistance caring for a loved one or long-term care, we’re here to meet your specific needs. Contact us directly to speak with a home health care professional or Request a Free In-Home Assessment. Together we can determine the right plan of action for your family.